Join us for networking and a presentation by Benjamin Ibarra-Sevilla, an Associate Professor of Architecture and Historic Preservation at the University of Texas at Austin. Benjamin will discuss two restoration projects of 16th century buildings in Oaxaca Mexico: the monastery of Santo Domingo de Guzman and the open chapel of Teposcolula. 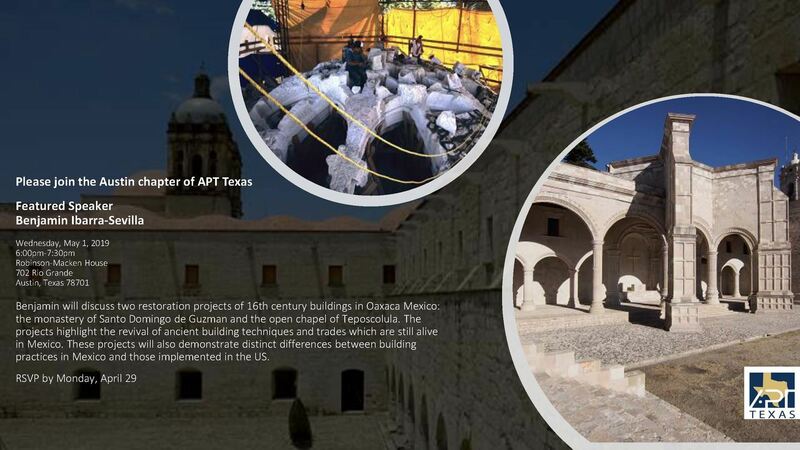 The projects highlight the revival of ancient building techniques and trades which are still alive in Mexico. These projects will also demonstrate distinct differences between building practices in Mexico and those implemented in the US. Parking is available on the street. We encourage public transportation or carpooling to conserve resources. Thank you! On May 4, 2019, Preservation Texas presents the Bassett Farms Conservancy Open House and Historical Marker Dedication. The event will include an open house showcasing the historic buildings and artifacts, music and Whup's Boomerang Bar-B-Q, named by Texas Monthly as one of "The 50 Best BBQ Joints in the World". This is a FREE event, but there will be a ticket charge for anyone who wishes to join us for lunch. Please register in advance. Lunch tickets on sale now! APT Texas will be leading a conservation workshop focusing on historic metals after lunch. Register for the event using the link provided by Preservation Texas on their website (http://www.preservationtexas.org/openhouse/). Additional information can also be found on the Facebook event page (https://www.facebook.com/events/376376729883268/). REHABARAMA is a single-day service event that brings together local contractors, volunteer groups, and students to perform repair and maintenance on historic and aging houses in the Mission Historic District in San Antonio. In the spirit of neighborhood revitalization, REHABARAMA focuses on hands-on preservation of historic resources and serves as an educational tool for those that are interested in the preservation trades. Work performed at REHABARAMA includes wood window and glass repair, porch repair, wood siding and stucco restoration, and more! Michael Kubo is Assistant Professor and Program Coordinator for Architectural History and Theory at the Gerald D. Hines College of Architecture and Design, University of Houston. He was previously the Wyeth Fellow at the Center For Advanced Study in the Visual Arts, National Gallery of Art in Washington, D.C. and associate curator for OfficeUS, the U.S. Pavilion at the 2014 International Architecture Biennale in Venice, Italy. His recent publications on the history and preservation of twentieth-century architecture and urbanism include Heroic: Concrete Architecture and the New Boston (2015), OfficeUS Atlas (2015), and the forthcoming Imagining the Modern: Architecture and Urbanism in the Pittsburgh Renaissance (2019). He is currently preparing a book on The Architects Collaborative and the authorship of the architectural corporation after 1945. Kubo holds a Ph.D. in the History, Theory, and Criticism of Architecture from the Massachusetts Institute of Technology and an M.Arch from the Harvard Graduate School of Design. His writing has appeared in publications including the Journal of the Society of Architectural Historians, Journal of Architectural Education, Harvard Design Magazine, Bauhaus Magazine, Architects Newspaper, PRAXIS, MAS Context, CLOG, and Volume. Prior to joining the University of Houston, Kubo taught studios and seminars at Pratt Institute, the University of Texas at Austin, and SUNY Buffalo, where he was the Peter Reyner Banham Fellow for 2008–09. 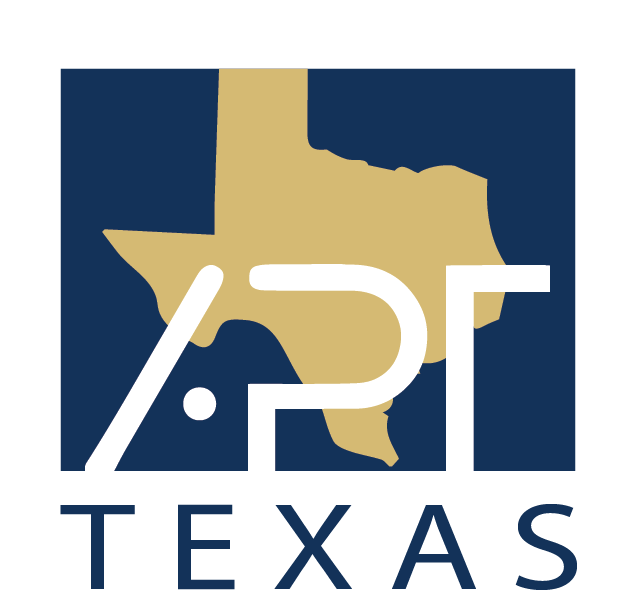 Make sure to follow APT Texas on Facebook and Instagram for the latest chapter news and events!